Our first step is to learn about you--your goals, values, and unique life situation. We strive to listen carefully in order to discover what it means for you to live a fulfilling life. Once we understand your unique life goals, we will work together to gain a complete picture of your financial life, making sure that we are on the same page and ready to move forward. With your goals and data in mind, we can now develop a personalized financial plan that will help you pursue your goals and overcome your financial challenges. Once we have developed your plan, we help you understand our recommendations and make you aware of any strengths or weaknesses of your financial situation. 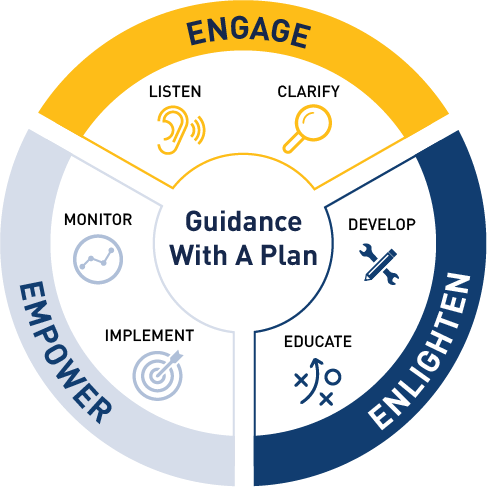 After being educated about your plan, you are now ready to implement its recommendations. Together, we will overcome any challenges you face while putting your plan into practice. Because your life is dynamic and always changing, your financial plan will need to change too. We will use your wealth management portal to monitor your progress and we strongly encourage you to meet with us regularly to help you remain on track and adapt your plan to overcome new challenges as they arise so you can confidently achieve your goals and live a fulfilling life. A printable copy of this process is available here.